Comes with plastic nose cone, pre-cut plywood fins and rings, 15" plastic parachute kit. Enjoy the fun and excitement of clustering, combined with a stylish split-fin design. 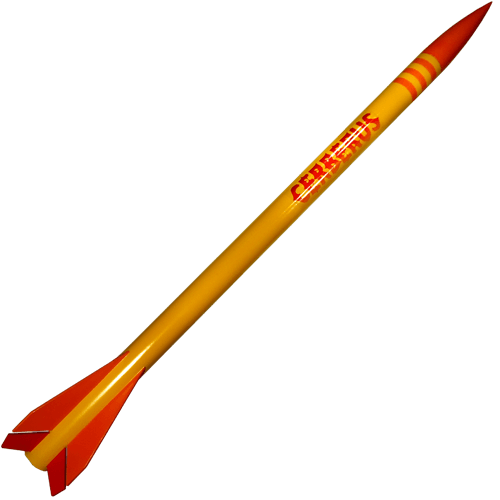 Unleash the raw power of this flying model rocket with a cluster of three A to C motors. Push the launch button and watch it soar! No need to worry about the wadding; this kit comes with the ejection baffle ! The Cerberus stands nearly 3 feet tall. This rocket kit includes large self-adhesive decals and parachute kit for recovery. While the motor mount assembly is different than non-cluster rocket kits, it is quite easy to build. There is no space for the motors clips and therefore motors are friction-fit.